At Collision 2000, we work on all popular makes of domestic and foreign cars and our service team has the experience necessary to restore your vehicle’s original mechanical and structural integrity and appearance. Visit Collision 2000 for certified, professional service. We are certified by the National Institute of Automotive Service Excellence (ASE). The first question on every customer's mind is, "Will my car my car be the same as it was before the accident?" At Collision 2000 the answer is a confident YES! We know you want to have your vehicle return to you in the condition it was before the accident. Therefore, we take tremendous pride in making sure you do get your car back to pre-accident condition. The entire staff of Collision 2000 technicians and specialists are certified by ASE. We proudly display each staff member's certification certificate in our front office for your review and inspection. At Collision 2000, high quality premium paint is the standard paint we apply on all the vehicles we work on. We use Standox® paint on your vehicle. 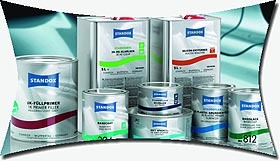 Standox® is a premium product brand within the DuPont Performance Coatings portfolio. 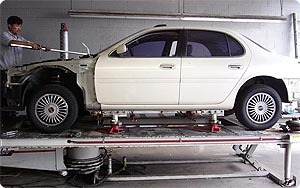 Car on a computerized frame pulling system. Quality repairs depend on quality equipment. This is why we use Chief Automotive EZ Liner & Genesis computerized measuring system to restore your vehicle to factory specs with accurracy and precision. We take pride in our work and we will stand by it for the life of the ownership of your vehicle. Collision 2000 offers a lifetime warranty for all the labor that we perform. (Parts and paint are covered under the manufacturer's warranty.) Ask us or see our warranty information page for further details.